(Newser) – More than 100 hippos in Namibia, including some seen floating on their backs in shallow waterways this week, may have died from an anthrax outbreak that could now affect other species. Officials say 10 dead hippos were discovered in Bwabwata National Park in northeast Namibia last Sunday, followed by another 99 over the intervening days, per the Namibian. "Our veterinary services are currently working at the area to determine the cause of death … but the signs so far show that it could be anthrax," Namibia's environment minister says, per the Guardian. Environment rep Colgar Sikopo tells New Era that an anthrax outbreak "mainly occurs when the level of the river is so low" that it exposes bacteria that can hide in soil for years. So the same people that are offended and find it undignified to wear the donated clothes of "dead white people" think "free food" when they see a dead and bloated Hippo floating, or lying on the ground ? Probably poisoned for their teeth which are similar to ivory on the Chinese market. They say the bodies will be incinerated to stop a potential outbreak. It's probably to conceal that fact that the coroner will remove all the teeth before destroying them and hand them over to the poachers for a pre-arranged price. 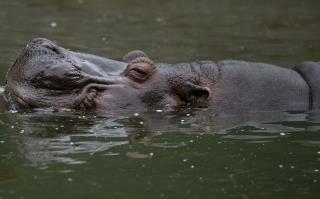 Just tweeted - "The hippos of Nambia are dying. Sad, very, very sad"